Honda's next generation fuel cell-electric vehicle will feature the world's first application of a fuel-cell powertrain packaged completely in the engine room of the vehicle, allowing for efficiencies in cabin space as well as flexibility in the potential application of FC technology to multiple vehicle types in the future. Significant technological advancements to the fuel-cell stack have yielded more than a 60 per cent increase in power density while reducing the size of the stack by 33 per cent compared to the FCX Clarity. It is anticipated to deliver a driving range of more than 300 miles with quick refuelling of about three minutes at a pressure of 70 MPa. Showcasing exciting and modern styling, the Honda FCEV Concept features sweeping character lines underscored by an ultra-aerodynamic body. The Honda FCEV Concept also delivers ample passenger space and seating for five passengers. 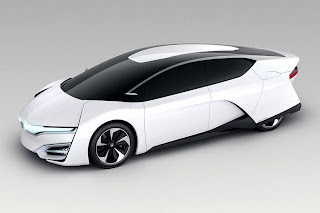 "The Honda FCEV Concept hints at Honda's future direction for fuel-cell vehicles," said Tetsuo Iwamura, President and CEO of American Honda Motor Co., Inc. "While this car is a concept, it points toward a very real future.